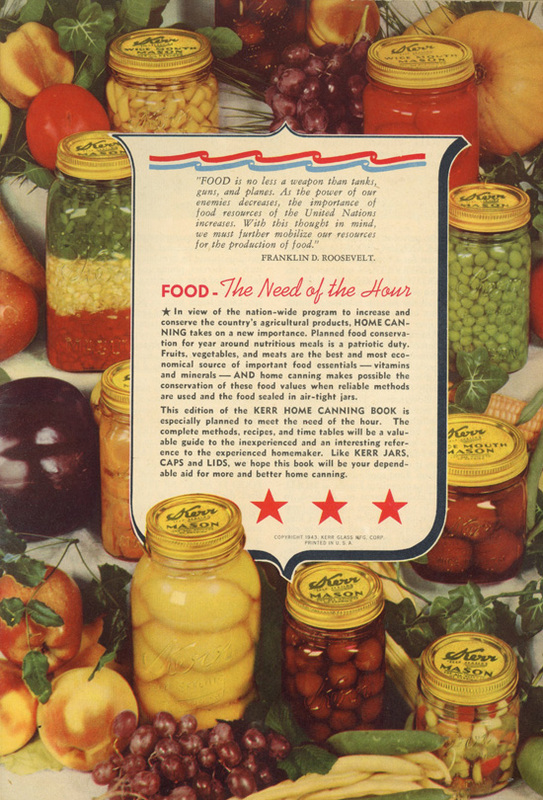 Cookbook #226: Kerr Home Canning Book, Kerr Glass Manufacturing Corporation, National Nutrition Edition, 1943. 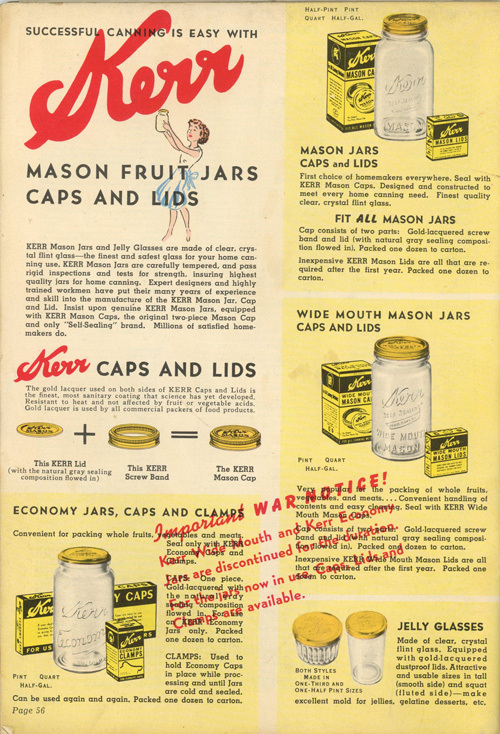 The time is 1943 and World War II is raging when this Kerr Home Canning Book is published. My parents, grandparents, uncles and aunts are affected, whether serving in the armed forces or living in the US. The entire American population gathers together to help the war effort. I wish now that I had had long talks with my parents and grandparents about the war, and learned more about their experiences, their feelings. The inner cover is below. 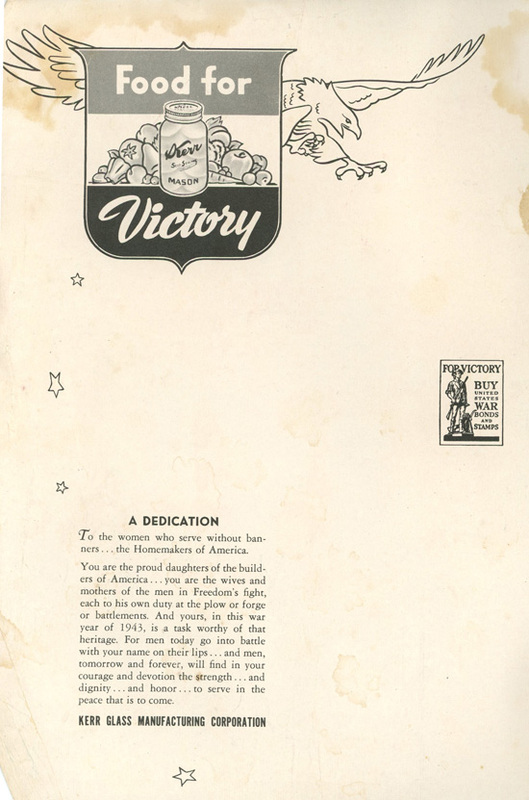 Note the “Food for Victory” slogan and the dedication to “the women who serve without banners . . . the Homemakers of America”. Food for Victory refers to “victory” or “war” gardens: fruit and vegetable gardens planted in public parks and private homes during both world wars. According to Wikipedia, by May 1943, there were 18 million victory gardens in the United States. “Grow your own, can your own” was the slogan of these families tending victory gardens. 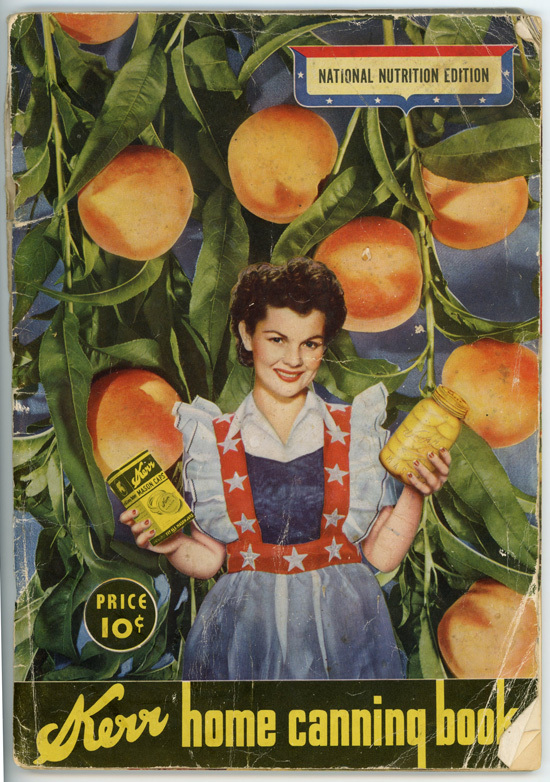 Kerr Home Canning Book has great color photos. Below is the title page. I enjoy the quote from Franklin D. Roosevelt, and “Food – The Need of the Hour”. Following the introduction are a few pages of how to put up foods using the open canning method (for fruits and pickles) and pressure cooker processing (for vegetables and meats). The instructions are clear and helpful. (But If I were to use pressure cooker processing today, I would use the instructions that would come with the equipment.) Oven processing is also described. And now, the recipes! 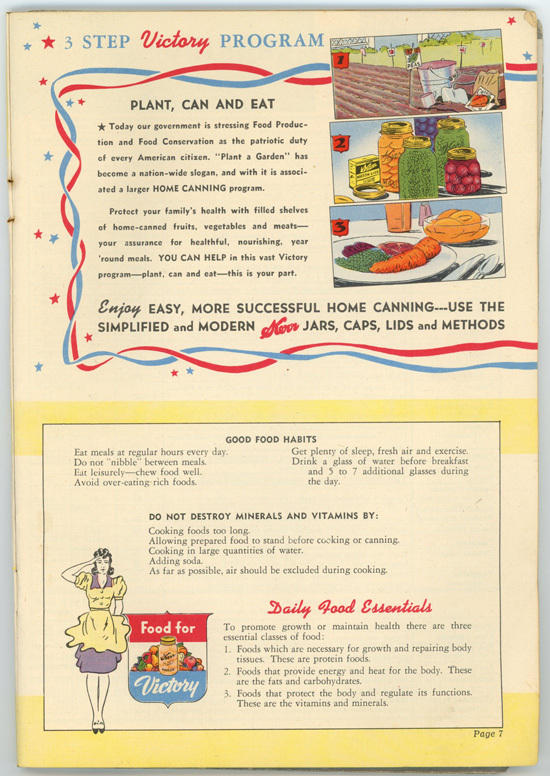 There are some treasures in the main content of this Kerr Home Canning Book. Canned fruit recipes are first, using the open kettle or hot or cold pack canning methods. When summer and fall Colorado harvests treat me with quantities of peaches or apricots or strawberries, I make jam. Jam takes a lot of sugar. But this book points out that all fruit can be canned successfully without any sugar, as sugar is used only to sweeten the food and does not keep it from spoiling. This is an important fact, since sugar was one of the foods rationed in World War II. Fresh fruit is packed into sterilized jars and and a thin, medium, or heavy sugar syrup is added. Proportions of sugar and water these three types of syrups are given to help canners sweeten sparingly, and recipes for these syrups from white corn syrup or honey are included. The second recipe section is for canned fruit juices. I found this interesting, because I’d never think of canning fruit juices myself! Most of the juices are canned in a boiling water bath. Some of the more interesting recipes are for mint julep juice, peach nectar, pear nectar, strawberry syrup, and grape juice lemonade. The reason is bacteria, yeast, or mold contamination. Botulism, for example. No thanks, I’ll trust the current food industry for my canned vegetables. But people with a good canning pressure cooker might enjoy the recipes in this section for home-canned broccoli, cauliflower, pimiento peppers, hominy, mushrooms, boston baked beans, and sauerkraut. 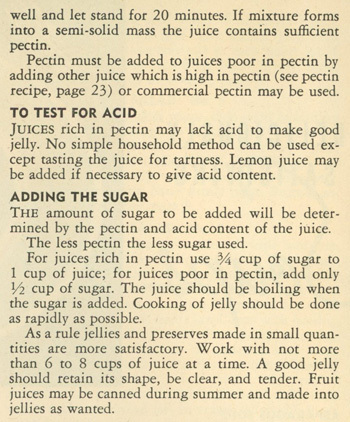 The section on jelly making begins with a discussion of pectin. Pectin, in combination with fruit acid and sugar, thickens or “jells” jams, jellies, and preserves. In my post on the Encyclopedia of Cookery, Vol. 9, I learned that pectin comes from the cell walls of citrus, apples, and sugar beets. Before pectin was sold commercially, home canners had to make their own. In the Kerr Home Canning Book, I learn that “the homemaker may extract the pectin from fruits that are known to contains it, such as apples, plums, and quinces, and feel quite confident that she can make jelly”. 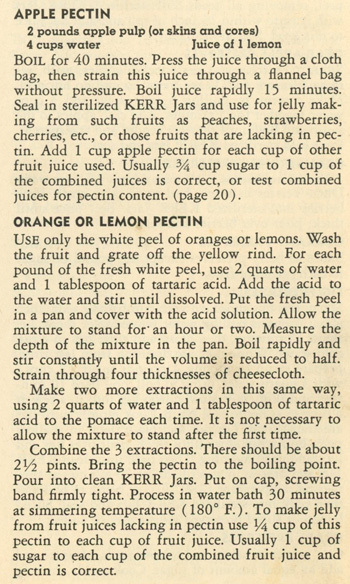 In the above excerpt, they do state that “commercial pectin” can be used, so apparently boxed or bottled pectin was available in 1943. 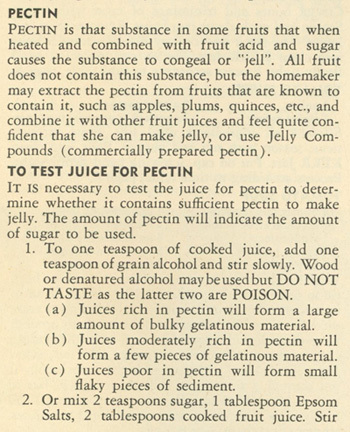 Sure enough, Wikipedia states that pectin was commercially produced by the 1920s. Jelly recipes include mint jelly, orange jelly, pineapple jelly, and rose geranium jelly. Preserves recipes include an interesting pumpkin preserves recipe. Jams are next – I make a lot of jams! I like the variety of recipes in this section, some unusual fruits, interesting mixtures of fruits, and a tomato jam. The recipe for peach jam directs the cook to cut up peaches, cook without the addition of water, measure the cooked peach pulp and for each cup of peaches add 1 cup of sugar, and finally cook until desired consistency. I commonly use the peach jam recipe that comes with the little packets of pectin: you prepare a specific volume of peaches, add a specific amount of sugar and lemon juice, and a packet of pectin. The recipe in this booklet is much more versatile – you can make just as much jam as you have fruit, and skip the pectin altogether. Fruit butters and conserves are next. I have made fruit butters, namely, apple butter (and sometimes I vary the recipe by adding pears). 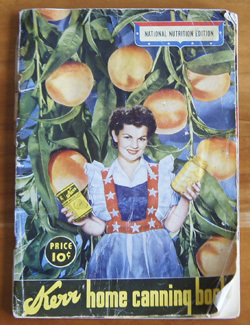 Kerr Home Canning Book includes recipes for grape butter, peach butter from dried peaches, and tomato and apple butter. Conserves vary from jams in that they are a mixture of several fruits often combined with raisins and nut meats: cherry conserve contains raisins, peach and cantaloupe conserve includes walnuts, and grape gumbo includes grapes, oranges, and raisins. Marmalades! Again, many possibilities, 18 in all. Pickles are next – someone wrote notes in the mustard pickle recipe, was it Ruth Vandenhoudt, or my grandmother? “Olive Oil Pickles” intrigue me, as well as Pickled Eggs, Pickled Onions, and Watermelon Pickles. Catsups, Chutneys, and Relishes include recipes for apple, crab apple, cranberry catsups, as well as the traditional tomato catsup. The next section is for canning meat, poultry, and game. I’d never think of home canning these today. “Bunny Sausage” is made from rabbit meat, onions, and spices. Brains, liver, heart, and kidneys are also canned. Or, one can can chili con carne, stewed chicken, or meat stews. Mince Meat is a recipe I’ve run across before (Encyclopedia of Cookery, Vol. 7); mince pie used to be served at Thanksgiving or Christmas at our family gatherings. It’s made from chopped lean beef, suet, and a variety of fruits and spices. Pickled Pigs’ Feet! “Scald, scrape and clean the feet very thoroughly” it says. No thanks, I say! A short section on canning fish and a section of “a bit of the unusual” like spaghetti sauce and hot tamales end the recipe sections of this booklet. 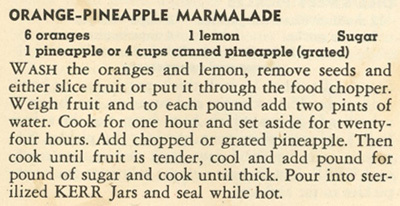 I decide to make Orange-Pineapple Marmalade for this blog. They are so pretty! 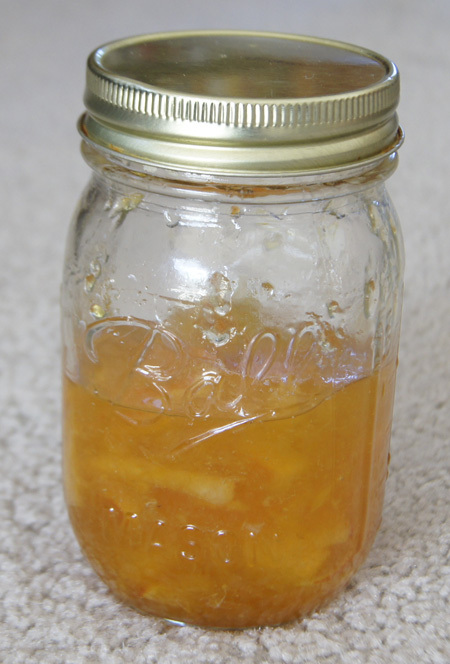 Here is how I made my Orange-Pineapple Marmalade. 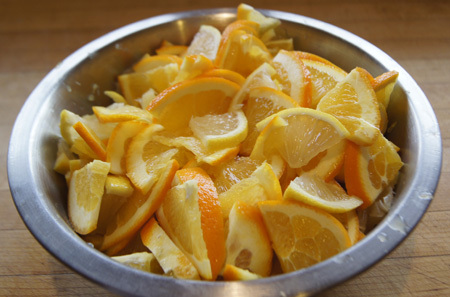 Weigh the sliced oranges and lemons, then add 2 pints (1 quart) of water for every pound of oranges/lemon, mixing them in a large (your largest!) pot. Mine weighed 2 pounds and 3 ounces, so I added 2 quarts plus 1 cup water. Bring the mixture to a boil, then simmer (sort of a “high” simmer) uncovered for an hour, stirring occasionally. Cover the pot and let it sit overnight. Add the pineapple to the orange/lemon/water mixture and cook until the fruit is tender. I cooked about 20 minutes, mainly to boil off some of the liquid, since the fruit mixture will be cooked more after the sugar is added. I let it cool a bit, but not a lot, I simply carefully poured it into a tared metal bowl on my kitchen scale. I had 4 pounds and 12 ounces. So, I added 4 pounds 12 ounces of sugar. Cook the mixture of fruit and sugar until thick. I cooked mine about 45 minutes at a hard boil using high heat (not my burners highest heat; about 7-8 on a scale of 1-9. I stirred it a lot to prevent it sticking to the bottom of the pan. At first it was obvious that a lot of water was boiling off; later it finally began thickening and foam rather than water bubbles formed on top. When I felt it was thick enough, I used an instant-read thermometer and it registered 212˚ F.
Stir and skim the hot marmalade for 5 minutes. 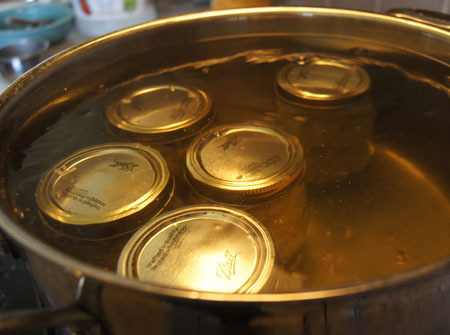 Pour into freshly washed and hot-rinsed jars, top with a canning lid, and invert to complete the seal. This marmalade is excellent! It is a bit “sticky”, like it was cooked too long. Next time I would add about half the amount of water to boil the orange and lemon slices. And I might even use more pineapple. But for a first try, we sure are enjoying this batch of marmalade. Here is a scan rather than a photo of the nostalgic cover. Cookbook #172: Putting Food By, Ruth Hertzberg, Beatrice Vaughan, Janet Greene, The Stephen Greene Press, Brattleboro, Vermont, 1973. The following is a quote from my own blog a couple years ago, when I covered the Complete Guide to Home Canning, Preserving and Freezing USDA. As I stated in my 2-year old blog post, these days I only put up jams. 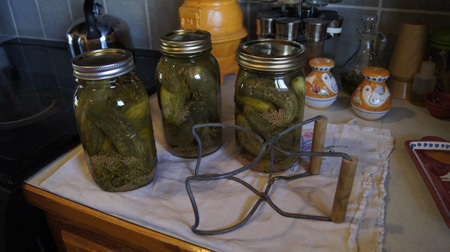 Well, that is, at least until I wrote that post and made dill pickles – I’ve made them several times since. Home made pickles are wonderful. 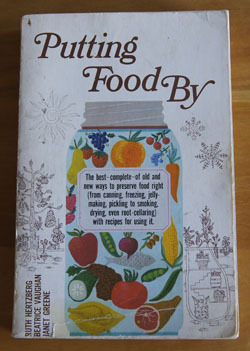 I probably bought Putting Food By and the Complete Guide to Home Canning, Preserving and Freezing USDA in that era, and used the information to put up the overflow from our garden. We even had an ancient canning-pressure cooker. Ah, the memories. I think it’s the chemist in me that makes this all fascinating. And the fact that I love fooling around in the kitchen. Alas, time and the easy availability of good canned and preserved foods makes delving too far into putting food by . . . well, I’d say I have tons of other things I like doing too. And I don’t have a vegetable garden. The canning directions and recipes in Putting Food By are clear, and cover the gamut of anything I ever might want to put up. 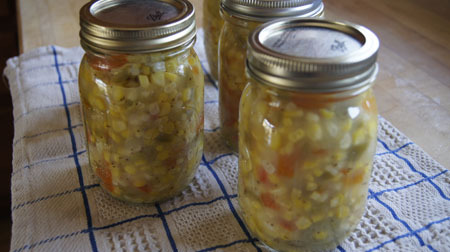 I have no trouble finding something to try for this blog: “Corn Relish”. 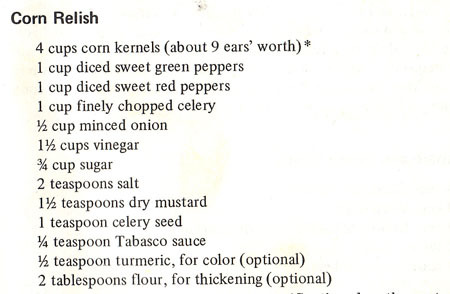 It’s corn season here in Colorado, and a corn relish sounds like a nice accompaniment for Mexican food. 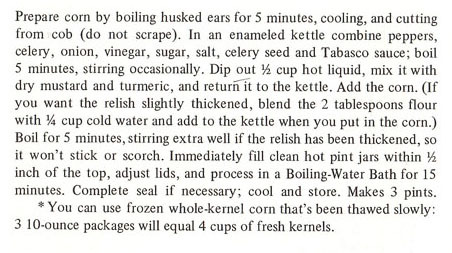 This corn relish requires a “hot pack”. When I put up jam and such, I always use the popular 2-piece canning lids. To hot pack this type of canning lid, you put the hot vegetable or fruit mixture into hot sterilized jars, put a hot “dome” lid (the flat part) on top, screw down tightly with a hot metal screw band, and place the jar into a hot water bath that covers the jar to process. I refreshed my memory on this process by reading pages 10, 19, and 31. I decide to leave out the turmeric and add a California green chile, but otherwise follow the recipe. Shuck the corn and cook in boiling water for 5 minutes. Let cool, then cut the corn from the cob to make 4 cups. Set aside. 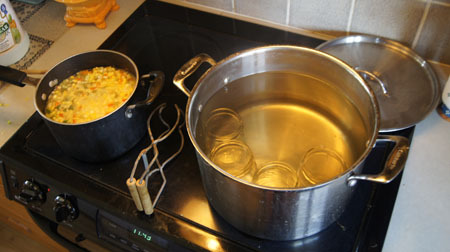 Bring a large pot of water to a boil and add 4-5 pint glass canning jars to sterilize them while you prepare the relish. Also have a small amount of boiling water to sterilize the dome lids. Combine in a big pot: peppers, celery, onion, vinegar, sugar, dry mustard, celery seed, and hot sauce. Bring to a boil and boil 5 minutes, stirring occasionally. If you want the relish thickened, at this point, add the flour and water mixture. Add the corn to the pot and boil, stirring frequently for 5 minutes. As the relish boils, remove the jars from the boiling water bath. 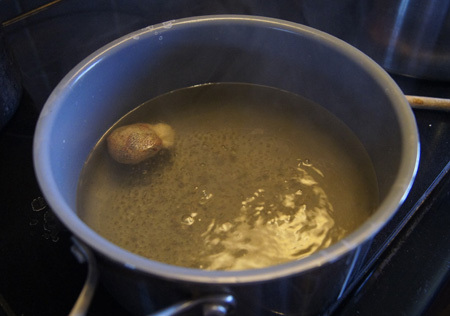 (This water bath is used in the next step, so don’t empty the pot yet!) Drain the jars on a clean cloth. Immediately pour the cooked, hot relish into the drained, sterilized jars. Top with a sterilized dome lid, then add the screw-top band and tighten. Put the capped relish jar back into the boiling water bath, making sure the level of the boiling water is above the level of the top of the jars. Process in the boiling water bath for 15 minutes. Remove the jars and let them cool. They will keep at least a year in your pantry, but always check the jars before use to make sure the seal is not compromised. In the photo below, I have the relish boiling and the empty jars sterilizing. Next, the filled, sealed jars are in their 15 minute boiling water bath. And here are the jars of canned relish! This relish is good. It is sweet and sour and hot. I will use it mostly as a garnish for Mexican food. I will definitely keep Putting Food By. 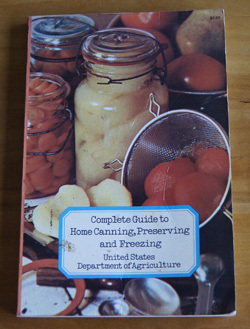 Along with Complete Guide to Home Canning, it is a great reference for when I come upon a lot of produce or have a hankering to play around in the kitchen. Cookbook #41: Complete Guide to Home Canning, Preserving and Freezing. United States Department of Agriculture, Dover Publications, Inc., NY, 1973. This is indeed a great permanent reference, even though it was published in 1973. (It only cost $2.50!) 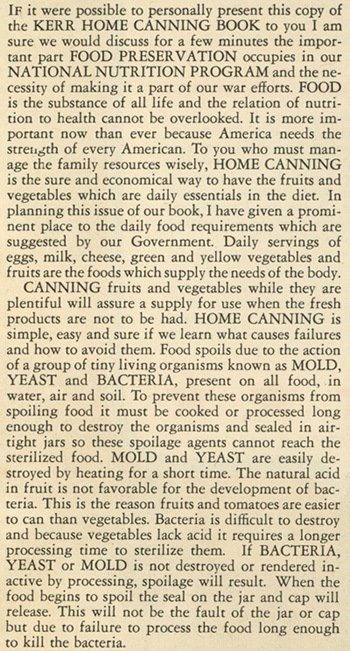 Safe canning facts do not change with the years. I’ve used this book a lot, you can see the food marks on the cover. 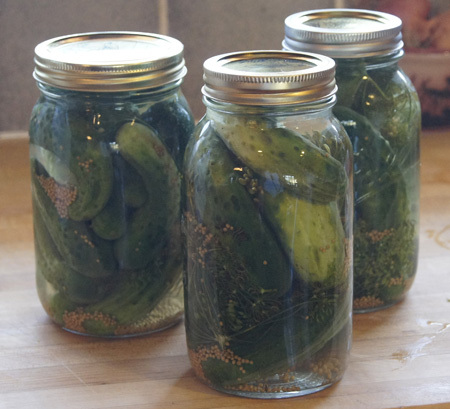 The book kind of plops open at “Making Pickles and Relishes at Home”, and that’s what I am going to do – make dill pickles! I used to put up tomatoes, hot salsa, jam, and pickles each year. I’d go to local vegetable stands and buy vegetables and fruits by the bushel. Why? So that I’d know the ingredients in my food, and I enjoyed doing it. Believe it or not, in the late 1970s it was hard to find good hot salsa. I used to send jars of canned goods off to family members at Christmas. But it’s been awhile. Nowadays I only put up jam, and usually I only make small batches. (I recently had lots of fun making apple butter for this blog, though.) I got excited when I pulled this book from the shelf. It’s August, and Colorado’s farmers’ markets have so much fresh produce to offer. I now have an excuse to go to the Boulder Farmers’ Market – an adventure! You never know what you are going to find, and just watching the people is entertaining. I need to back step just a bit before I get started on my adventure and the recipe for dill pickles. I want to overview the contents of this book. The freezing sections are the least useful to me. I mean, if I want to freeze a chicken, I buy it from a store and toss the package in the freezer. There are some strange instructions in the poultry freezing section. For instance, they describe how to make chicken sandwiches and freeze them in heavy waxed paper. I’d never do that. I’ll stick to the good parts of this book. Such as, the recipe for dill pickles. 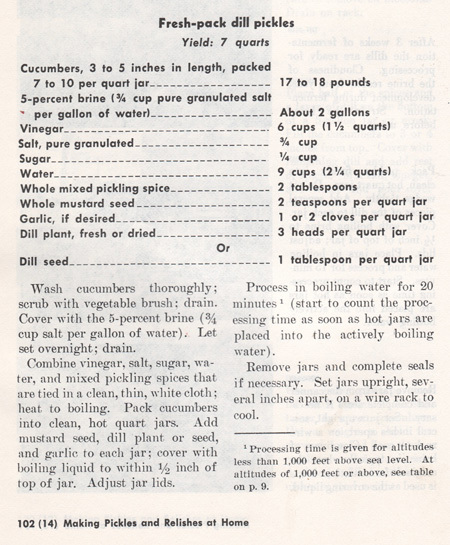 I scanned in the recipe (below), but the section also includes several pages of straightforward information on handling the jars and the cucumbers, a table for adjustment to high altitude, and how to store the pickles. I add necessary details in my own version of the recipe. The original recipe calls for some sugar; I left it out on purpose. I like sour dills. Wash the cucumbers thoroughly, scrubbing with a vegetable brush. Put them in a plastic bucket (or a glass container) with enough brine to cover and let them stand overnight. I covered the bucket lightly with a towel. Get your jars ready. Bring a very large pot of water to a boil: it needs to be taller than your quart-sized canning jars. Wash a few quart canning jars (I needed 3 but washed 5), then put them in the boiling water for 5-10 minutes to sterilize them. 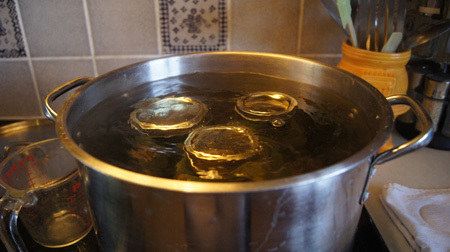 Carefully remove the jars from the boiling water and drain them. I was lucky to find my old jar grabber in the basement, it’s in one of the photos below. Keep the water boiling because you need it again. While the jars sterilize, tie up the pickling spices in a little square of cheesecloth. Combine the vinegar, salt, and water in a pot and drop in the tied-up pickling spices. Bring to a good rolling boil. I let it boil awhile to encourage the spices to release some color and flavor into the mix. Drain the brine off the cucumbers. Put some dill in each of your sterilized jars, then pack in several cucumbers, add more dill and some mustard seed, then pack until full with cucumbers. 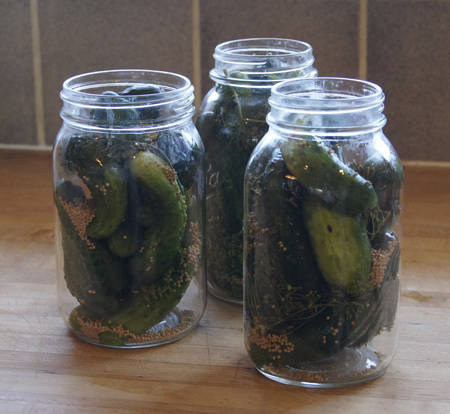 Take the pickling spices out of the boiling vinegar-salt-water mixture, then pour it into the jars to cover the cucumbers. Close the jars. I use two-piece metal jar caps. One piece is a flat metal lid with rubber-sealer around the bottom rim. The other piece is a metal screw band. Place the flat piece on the jar, then screw the metal band down tight by hand to hold the sealing compound against the glass. This lid has enough “give” to let air escape during processing. They do not need to be tightened further after processing. 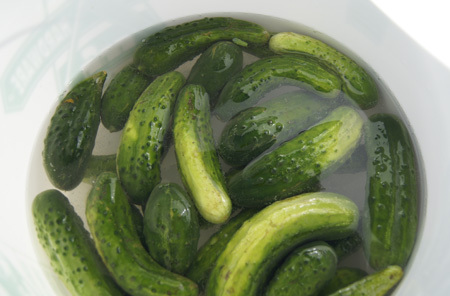 Immerse the filled and covered jars of cucumbers in the very large pot of boiling water. My pot was very full, so I had to remove some water as I added the last two jars. Bring the water back to boiling as quickly as possible. Start to count the processing time when the water returns to boiling, and continue to boil gently and steadily for 20 minutes (sea level) or 25 minutes (5000 ft). Remove the jars and set them upright to cool. Here, after the hot-bath treatment, you can see that the cucumbers look like pickles now, less bright green and more yellow-olive-green. I can’t wait to try these. But I have too! 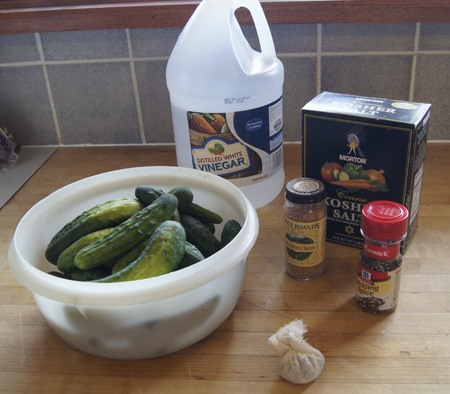 They need time for the seasonings to soak into the cucumbers and make them true pickles. I processed these on a Sunday and next Thursday I’ll put a jar in the refrigerator and on Friday I’ll try them. 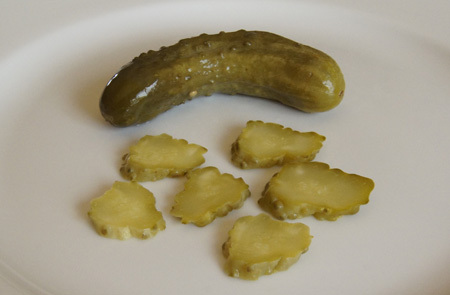 It’s Friday, and here are the pickles. Yes, these are great! I’ll make them again.